Happy Thanksgiving to all who were celebrating today! I hope there was lots of good food and good company for all! Like many of you I grew up a big TMNT fan. I was 10 years old when I saw the first action figure commercials in 1988 and remember looking everywhere for them before they finally arrived in stores. I actually still have most all my toys, over 65 + some still in package. 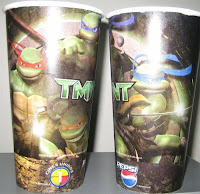 I was so into the cartoons and definitely loved the first 2 films along with the CG release of TMNT last year which was great to see the 4 heroes in green back in theaters. I was so taken back by the first movie being 12 years old. When the opening scene came up I'll never forget seeing for the first time those real-life Foot Soldiers packing up the truck with stolen goods. Who would have thought that 18 years later I would get an opportunity to own a piece of that movie magic. I found this through the Prop Store of London posted one morning back in June I believe. Perhaps it came from a former owner or production crew member? I honestly don't know how it happend upon the site being available. I really don't know how long it was up that morning, but without blinking I placed a layaway on it and paid for it over a few months time until my last payment and shortly arriving finally in September. I was a bit unimpressed by how they presented it on their site, but I was certain I could improve how it displayed. The initial photo shows what the mask looked like as received. I finally got around to working on it this past week and now it looks a lot more presentable. The only minor thing I did was fix up the few broken seams along the sides and removal of all the fuzz in the hook loop velcro. Other than that, this mask is maintained as it was received and think that the usage gives it personality. I wanted to maintain the overall integrity of the piece, but those seams didn't look good. It's amazing to see in person how different it looks than how it showed on screen. I thought the BUG EYES were metal wire mesh... its actually a plastic grid and painted! And the mask itself you'd think is black... no! Silvery gray spandex and then coated with a black fabric spray paint of some sort, giving it that weathered look. I would have never guessed as well as the metal gromets on the mouth that look to have originally been painted black, but has since worn through. This mask has definitely seen a lot of action looking at how worn it is. To finish off the bust I sewed a chest piece to cover over the shoulders/bust to make it look more complete. I still want to get a display case and darken the bottom base, but overall am very happy with the result compared to before. Unfortunately this kinda dwarfs my entire TMNT toy collection, so I don't know what I'll be doing with the toys! It is overall a very impressive piece and I do feel extremely lucky to own a true piece of my childhood from that day I first saw those Foot Soldiers on screen. That was a big deal then, it's a huge deal to own one of those masks. I'd like to add one more bit of importance to this piece for me. I believe this was the last project that Jim Henson worked on before he died. Owning a piece of something he was involved in is a real treat and I have always loved the work he has done with puppetry and creatures. I remembered crying the day of hearing of his death. He was so ahead of his time. I REALLY HOPE they are working on a BluRay edition of the live action films. They desperately need the HD treatment and I'd sure be one of the first to buy a set. Come on, New Line! Get with the program! I think those are words all Turtle fans can agree with - Hear, hear! 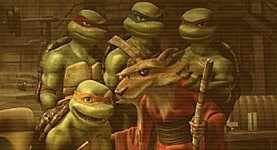 Happy 25th Anniversary to the TMNT! 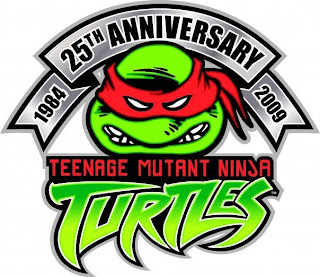 The official 25th anniversary of the TMNT won't be celebrated until May 5, 2009, 25 years after the release of the first TMNT comic book. 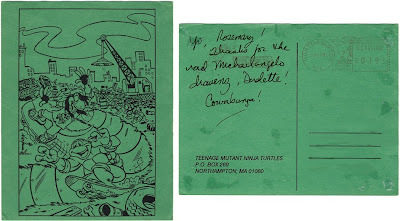 But today marks 25 years since Kevin Eastman and Peter Laird sat watching too much bad TV and made the first doodles of what would become the Teenage Mutant Ninja Turtles. Hurrah! The above DVD covers caused quite a stir when they appeared on Amazon.com out of the blue yesterday. Not just with fans, but at Mirage itself where they first learned of these new DVD covers at the same time. What does this mean? Are these DVDs with brand new content? Or just repackaging of the old content? Unfortunately, it's just repackaging of the old content. Does this mean that there's no chance of a Special Edition and/or Blu-Ray release of one or all of the movies? NO. I can report that there is still hope in both regards, although it is also far from being a certain thing. Hopefully I can provide a more specific update within the next couple of months. 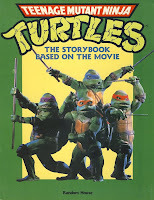 This is the storybook based on the first TMNT movie (an item I read a billion times during the long months between the theatrical release of the movie and the VHS release). 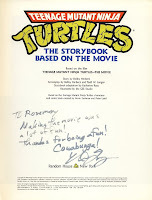 The title page is signed to me by Michael Turney, who played Danny Pennington in the movie. So I was digging through my boxes of stored stuff in the attic yesterday. These are like boxes of things I have not opened in years and forgot about during my multiple house moves. 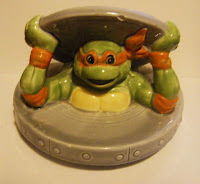 I came across my old Michaelangelo ceramic cookie jar. This is something my mom bought for me back in 1991 at a seaside gift-shop in a place called Weston Super Mare. 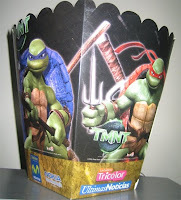 I think at the time this was around £5 and of course there was a colour of each turtle respectively. I figured I’d take out this find and immortalise it further in cyberspace in victory of all the house-moving it has survived. I am certain this was a UK only item and has a Hero Turtle like feel to it. 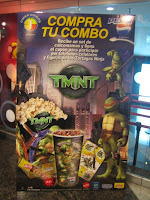 Have a special TMNT item that you'd like to share? E-mail me your story and pics! Peter Laird's "Blast From the Past"
I got kinda annoyed with the disjointedness and disorganization of Peter Laird's "Blast From the Past" posts on his blog (it's pretty impossible to find any of the old stuff without scrolling through every single page), so I made a chronological listing of all of them. Everything that has been reposted to Blogger is linked to Blogger; anything not yet reposted to Blogger is linked to the original posting on the Planet Racers Web site. 011 - "The Art of Mirage Studios"
026 - Leonardo at "Fandom Directree"
029 - "Who is the Unknown Ninja?" 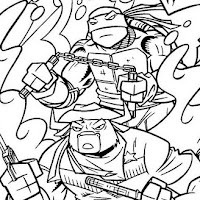 050 - TMNT as Drawn by Jack Kirby! 090 - Roughs for Leo and Usagi Story "The Crossing"
096 - Sketches for Foot Robot from "City at War"
118 - Design for Evil Mutant's Vehicle -- "Hover Trike"
127 - Robot with Birthday "Cake"
129 - Motorcycle Designs for "Return of the Justice Force"
146 - "They Came from the Fifties"
148 - "A World Beyond"
A New President? Or an Old School President? Here's something random that I found by complete accident. Visit Zazzle.com to pick up this creative celebration of the new President-Elect, Barack Obama, that plays off of the classic TMNT cartoon logo! Doing a bit of Fall cleaning today and I came across this old scrap of paper. This is quite the testament to some of the random stuff I'll end up clipping and saving. The scrap is simply a piece of brown packaging paper with postage affixed. 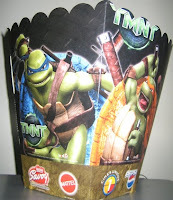 The package, having come from Mirage Studios, also features a stamp with Raphael and the original TMNT comic book logo. I think most all of the mail they sent at this point in time featured the stamp. Mail from Mirage today features no such stamp, probably due to changes in postage machines.